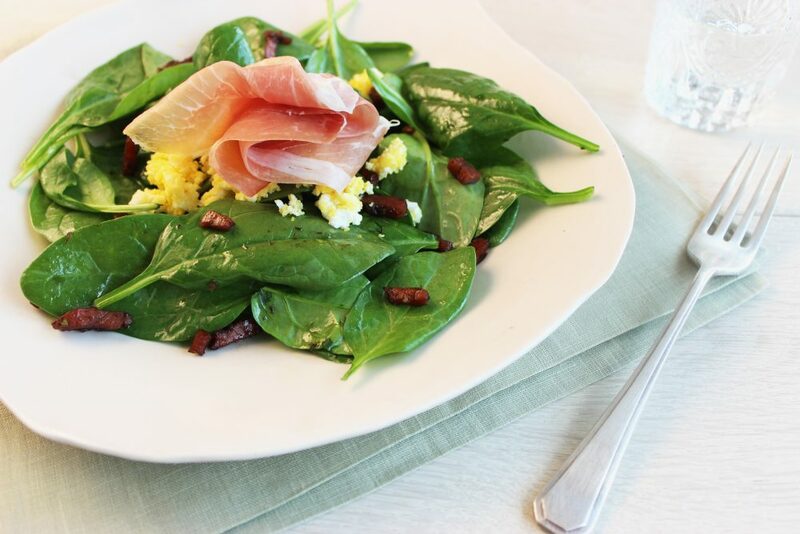 Greens are always better when they’re topped with Prosciutto di Parma, right? So try this salad with prosciutto, topped with an “egg mimosa,” made by pressing hard boiled eggs through a sieve. The elegant result resembles spring mimosa blossoms! Your guests will be stunned by the beautiful greens beneath lovely prosciutto ribbons and a delicate egg topping. Once you taste the rich prosciutto vinaigrette, there’s no going back to plain old salad dressing either. This salad with prosciutto adds a whole new dimension to salads with just a few simple techniques and high quality ingredients. Serve as a sophisticated appetizer or increase the serving size to enjoy as an entrée. Place a skillet over medium heat and add 2 tablespoons of the olive oil and the prosciutto. When the prosciutto starts to crisp, add the shallots and cook gently until softened and beginning to brown. Add the chopped herbs and cook, stirring, for 1 or 2 minutes. Add the vinegar and simmer briskly for 5 minutes. Add the rest of the olive oil and keep warm. Arrange the spinach in a bowl or on a platter. Over a cutting board, press the hard-boiled eggs through a mesh sieve with a spoon to produce a fine crumble that resembles spring mimosa blossoms. To serve, drizzle the warm dressing over the spinach, top with a few slices of Prosciutto di Parma, then sprinkle with the crumbled egg and eat immediately. Looking for the perfect wine to pair with this dish? Check out our wine pairings page to learn more.